Removal ProcedureRaise and support the vehicle. Refer toLifting and Jacking the Vehicle.Drain the rear differential, if needed. Refer toDifferential Oil Replacement.Remove the exhaust system. Refer toExhaust Muffler Replacement.Remove the rear wheel drive shafts. Refer toRear Wheel Drive Shaft Replacement.Remove the propeller shaft from the vehicle. Refer toPropeller Shaft Replacement.Support the rear differential with a transmission jack stand. Remove the rear differential support bushing bolts. 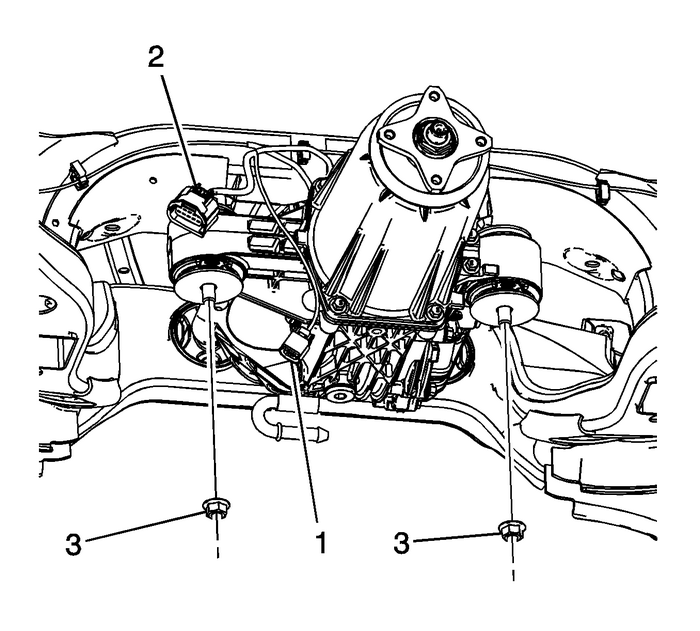 Remove the front mounting nuts for the rear differential-(3).Lower the rear differential to gain access rear differential clutch control module.Remove the small electrical connector from the control module-(1).Remove the large electrical connector from the control module-(2). Note:When positioning the rear differential assembly in the rear cradle, leave enough roomto access the clutch control module. If replacing the clutch control module, the new module must be programmed. 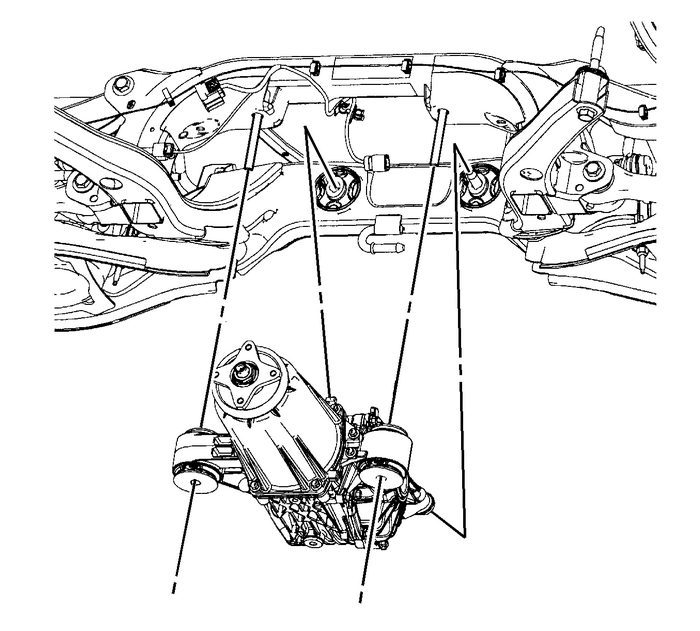 Refer toControl Module References.Position the rear differential assembly in the rear cradle. Install the small electrical connector-(1).Install the large electrical connector-(2). Note:When installing the front mounting bolts tighten by hand. Install the front mounting nuts-(3). Install the rear differential support bushing bolts.Raise the rear differential assembly into place. 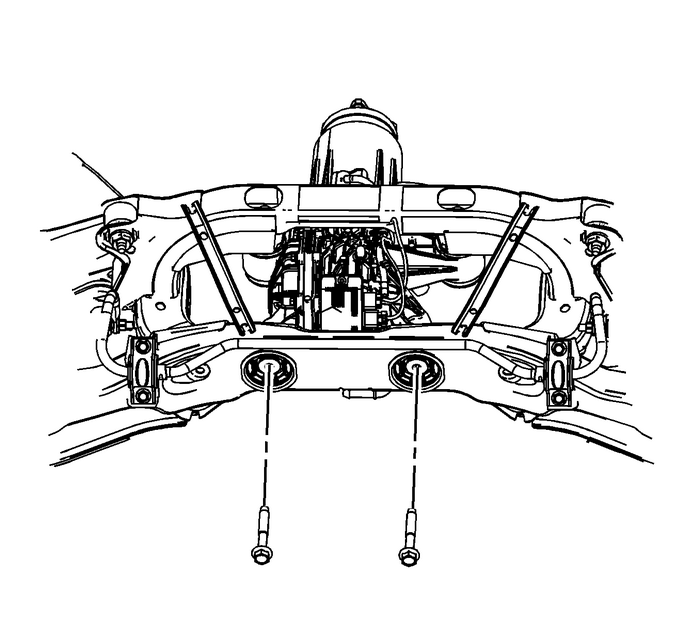 Tighten the front mounting nuts to 122-Y (90-lb-ft).Tighten the rear differential support bushing bolts to 188-Y (139-lb-ft).Remove the transmission jack stand.Install the propeller shaft. Refer toPropeller Shaft Replacement.Install the rear wheel drive shafts. Refer toRear Wheel Drive Shaft Replacement.Install the exhaust system. Refer toExhaust Muffler Replacement.Fill the rear differential assembly with fluid, if drained. Refer toDifferential Oil Replacement.Lower the vehicle.